The RLD6 is 6 inches wide and designed as an alternative for compact fluorescent and metal halide fixtures. 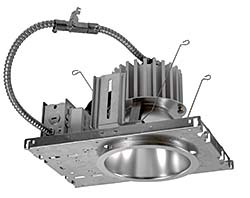 The fixture offers glare-free optics and a 45-55 degree cutoff angle. The fixture uses Optotronic® universal power supplies and is dimmable down to 1 percent. The luminaire has efficacies up to 79 lumens per watt and is available in light levels of 1,000-3,000 lumens. The fixture ships standard with 0-10 volt dimming interface and is available in 2,700 Kelvin (K), 3,000 K, 3,500 K, and 4,000 K correlated color temperature packages.